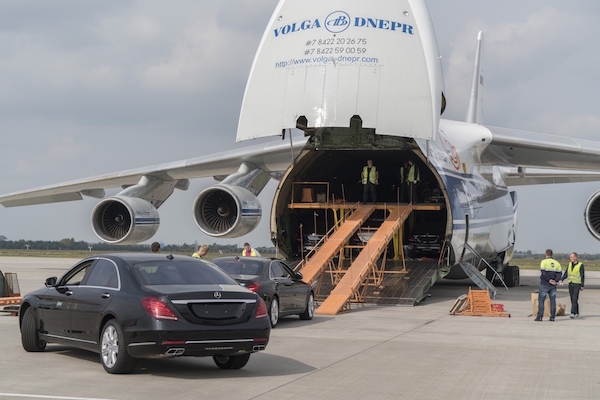 Volga-Dnepr Airlines has used the special two-tier car racking system developed for its An-124-100 freighter fleet to deliver 30 vehicles on a single flight to Luanda for the inauguration ceremony of Angola’s newly-elected President, Joao Lourenco. The valuable 90-tonne payload of vehicles was transported from Leipzig on behalf of the Angolan Embassy in Germany. It consisted of a fleet of Mercedes cars comprising 25 luxury sedans, three police cars and two heavy armoured G-class vehicles. Including tooling, the total load exceeded 110 tonnes. As a regular provider of air logistics solutions to the automotive industry, Volga-Dnepr designed and built its special racking system to help reduce the cost of air transportation for customers moving high quantities of vehicles. The two-tier platform enables cars and 4x4s to be driven onboard the An-124-100 and parked safely inside its spacious cargo cabin. For this particular flight, Volga-Dnepr’s experts developed an optimal loading technique based on the size and specifications of the vehicles being carried. This also ensured the airline was able to successfully meet the tight delivery deadline. “The vehicles were carefully loaded inside the An-124-100 freighter with minimum clearances. This was completed by our expert drivers who have special experience of loading vehicles using our two-tier racking system, with the assistance of staff from Volga-Dnepr’s operations base at Leipzig and the airport authority. Our local team managed the expeditious preparation of the aircraft, installation of the necessary tooling, and loading procedures to ensure the flight was ready to depart on schedule to support such an important event in Angola,” said Alexander Prokofiev, Deputy Head of Volga-Dnepr’s Load Planning Center. 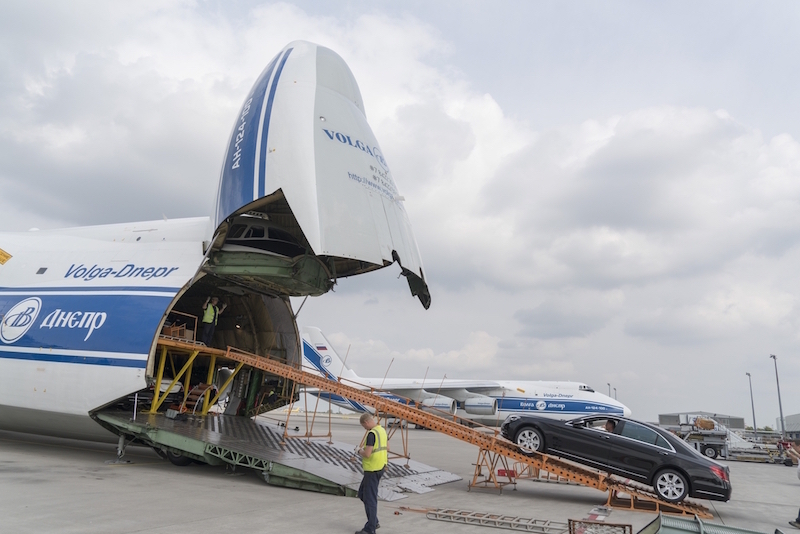 As part of Volga-Dnepr’s ‘Cargo Supermarket’ service offering, customs export formalities at Leipzig Airport were also provided to support the customer. This was Volga-Dnepr’s first-ever flight for the Angolan Embassy in Germany, whose officials highly commended the airline for the quality of service provided.